Conventional wisdom assumes that company management comes up with better ideas than employees. At The Vision Lab we’ve tested this assumption, and we’ve made some surprising discoveries. TVL is hired by management to crowdsource ideas from large groups of employees. For example, management might ask “How can we reduce production time of our XYZ product by at least 20%?” Employees give answers and also rank their peers’ answers. Our pairwise ranking system uses seed answers. Seed answers are pre-loaded into the system so employees have something to evaluate from the start. They are useful because they help define the context of the question. But they also represent management’s own best answers to the problem. So, how do employee answers compare to management’s seed answers? In the TVL system, every new contribution starts with a score of zero. The score then moves up or down based on the results of pairwise comparisons. Answers with scores greater than zero are generally good, while those with scores less than zero are generally not good. On average, among thousands of TVL answers, employee contributions have a 47% chance of scoring above zero, while management contributions only have a 33% chance of being good. So, employee contributions are significantly more likely to outperform than management contributions. But that’s only half the story. Employee contributions are also significantly more likely to underperform: 42% for employees versus 35% for management. 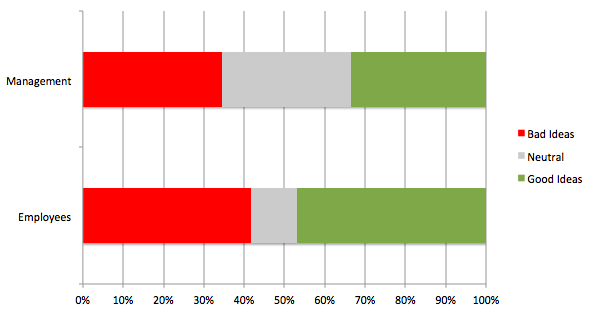 This is possible because very few employee answers are neutral: 11% for employees vs 32% for management. This data makes it difficult to conclude that either group is more wise. But it clearly indicates that management is more conservative than employees. In many aspects of business, that conservatism is justified and necessary. But management’s natural and appropriate conservatism impedes it from coming up with the most creative and unusual ideas. Any innovation program must, therefore, include the crowd.